Never shy about innovating, The Macallan Edition No. 1 is the first bottling in a new limited edition series from one of Scotland’s titans, with new expressions to be released annually. Per the company: The inaugural bottle’s theme is co-creation, while showcasing our mastery of wood. Each year, a special selection of oak casks will be handpicked to create a new Edition, inspired by Macallan lovers from around the world and co-created with different partners. The proportions of various cask types were hand-selected by master whisky maker Bob Dalgarno. Edition No. 1 is matured in 8 unique European and American oak cask styles and sizes, each contributing their own distinct character. Of those eight casks, seven are sherry and only one is American oak. No. 1 is a clear callback to the distillery’s heavily-sherried history, downright biting from the get-go with big citrus and spice notes. 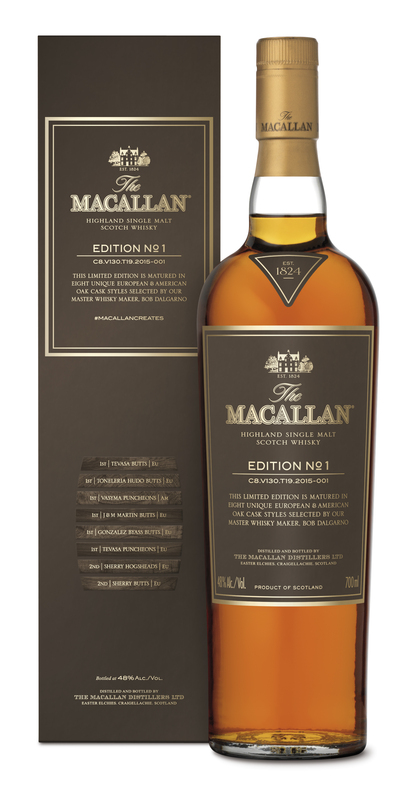 Punchy and lightly medicinal on the nose, those rich sherry notes kick things off in classic Macallan style. On the tongue, the whisky offers a big slug of orange oil and marmalade that winds its way into notes of toasted marshmallow, cloves, incense, and oily leather. The lengthy finish echoes more citrus, plus notes of sweet dates, raisins, and a touch of lumberyard. All told, this is a knockout expression from Macallan, offered at a much lower price than I would think the company could fetch for such a flavorful monster that has such a storied history. Hell, I’d buy it.